You can take a subway from Incheon Int'l Airport to Hongik Univ. (Airport Railroad). At the Hongik Univ. station, you have to transfer to Line 2 to get to Shinchon Station. Please get off at `Shinchon station' Gate 6. There are a few transportation options when you reach the Sogang University from the airport. The most convenient choice is to take the non-stop limousine bus which we strongly recommend. After you pass the customs inspection area of the airport, you will see the exit gate and bus stops out the window. The limousine bus ticket to the KCAT (Korea City Airport Terminal) can be purchased either in cash or with major (VISA or Master) credit cards at the bus ticket booths for 9,000 KRW. You can also pay the fare in cash when getting on the bus. The locations of the booths are denoted by the orange colored dots on the map below. After you pass the exit gate, you will see a row of bus stops with gate number. Please go to the bus stop 5B or 12A and take a limousine bus with Number 6002. Please make sure the destination of the bus is KCAT. For the details, click here. Here are the details on the limousine bus service. Please get off at `Shinchon station'. First, take a limousine bus with Number 6712 at the Gimpo Airport. Second, get off at `Shinchon station' station. When you walk from Shinchon satation Gate 6 to Sogang University, you can find Sogang University in 10 minutes. 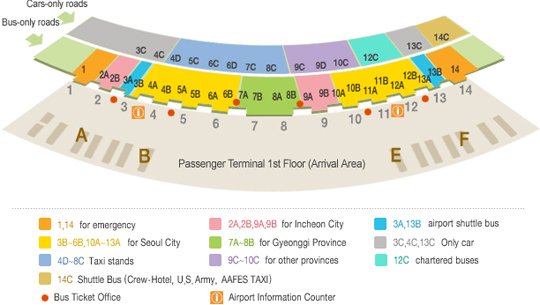 There are largely four transportation options available between Incheon International Airport and Seoul: taxis, private cars, airport shuttle buses, and the airport railway. 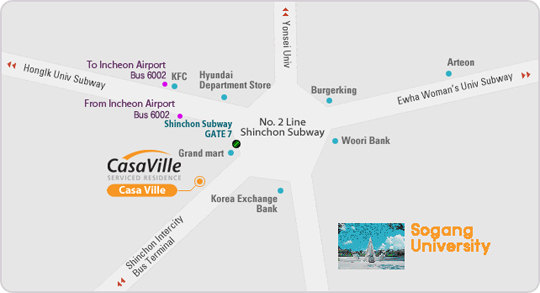 The airport shuttle bus covers all areas in Seoul, nearby Gyeonggi areas, and some local areas. It is recommended that travelers check in advance for the location of the shuttle bus tops and with information desks for bus tickets and schedules. Night shuttle buses and circle buses within the airport are available as well for easy transfers. The intervals are varied from 10 to 30 min. depending upon your destination. The travel time from Incheon International Airport to major areas in Seoul is varied as well, but it usually takes an hour to Seoul Station, 75 min. to Myeong-dong, 80 min. to Gangnam, and 2 hrs. to Jamsil. The airport railway runs between Incheon International Airport and Gimpo Airport and connects to Subway Line 5, which takes you to major areas in Seoul and nearby Gyeonggi areas. Taxis are available at 5C to 8C at the pick-up area on the first floor (Arrivals) of the terminal. Taxi fare including toll fee is roughly 60,000 to 70,000 won from Incheon International Airport to Sogang University. Seoul is one of the largest metropolises in the world with a population of over ten million people. It is also one of the most densely populated cities in the world with an area of 605 square kilometers. Due to the fact that nearly a quarter of the country's entire population is condensed within Seoul, traffic jams are an every day occurrence. Traffic can become extremely hectic all of a sudden, especially in the central business areas and the major roads leading to those areas. To relieve this congestion (and to the relief of many Seoulites) the city provides a convenient public transportation system. Various bus routes cover all corners of the city, but the most efficient method of getting around town is by the Seoul Metro. Not only is it cheap, the average travel time between stations is measured at 2~3 minutes. Such times are unimaginable for commuters traveling by car or bus during the hectic rush hours. However, buses are also a convenient way of getting around the city once you get the hang of the seemingly complex routes. Indeed, these routes are not as complex as they appear, upon careful inspection, as the maps and street signs are labeled in English. 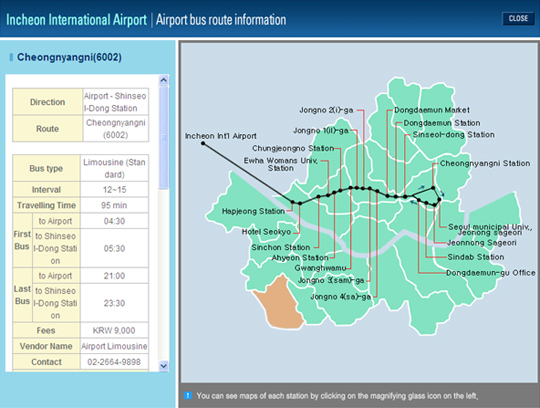 Trains to regional cities have become a lot more convenient to use with the addition of the KTX in 2004. In addition to the KTX, two major domestic airlines, as well as several other smaller airlines, provide flights to numerous regional cities on a daily basis. The public transit transfer system using T-Money cards is both convenient and a money saver. For example, if you need to transfer buses the base fare remains the same if the total distance traveled is less than 10km. 100 won is added to the fare for every additional 5km. Simply swipe your transportation card on the reader located at the rear exit of the bus. You can transfer up to four times, and the transfers must be done within 30 minutes of exiting a bus. If you transfer from bus to subway a small discount of 50 won will be deducted from the fare. To get information on subway/bus in Seoul, click the following links.